PMC-Colinet’s main product line of pipe and coupling threading machines come in two options, Rotating Product Technology and Rotating Tool Technology. The type of technology best suited for your company depends upon your needs as detailed below. 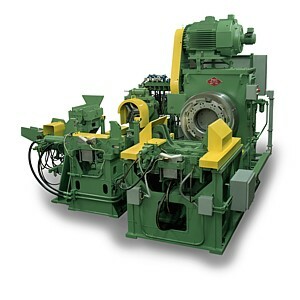 Our Rotating Product machines (RPP and RPC respectively in the model numbers) are designed for pipe and coupling finishers who make several size or product changes in a shift. These medium-high production machines are more flexible and quicker to set-up than our rotating tool machines and are most economical when producing smaller lot sizes or premium connections. PMC-Colinet’s Rotating Tool machines (RTP and RTC respectively in the model numbers) are high production machines designed for longer runs of the same type or size of product. These machines are also able to produce premium joints, but have longer changeover times than our rotating product machines. Our RP and RT machines are optimized for the production of Oil Country Tubular Goods (OCTG), in accordance with Specifications 5B, 5CT and 5L of the American Petroleum Institute (API). Both technologies are equally capable of producing finished pipe and couplings that comply with ASTM, BS, GOST, JIS, KS and most other global standards for tubular products.